Just as day was turning to night on Sunday, 28 August 2016, members of CCCWDC who started meeting earlier that evening to launch their tenth anniversary commemorative uniform were preparing to call it a day. 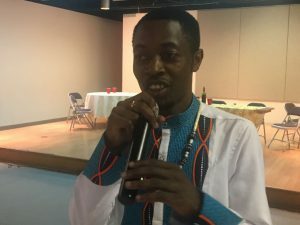 At the behest of Gwei Ben Fonlon, the master of ceremony, the crowd gathered at the center of the parish hall in the basement of Resurrection Catholic Church, Burtonsville. There was suspense in the air. Parishioners wondered: had they done well with the launch? Had they sold every piece of the 103 fabrics they set out to at the start of the ceremony? There was good reason to worry. 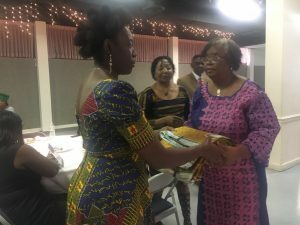 Attendance had been scanty, but less than an hour earlier Gwei Fonlon had sounded very jubilant when he praised the few in attendance for bringing a generous heart, along with loaded wallets and purses. “Did we sell everything?” one member whispered. The financial team was still looking over the numbers. Sales had been great, they reluctantly admitted, pointing out that the target was missed by 14 pieces. Nearly – but not there. 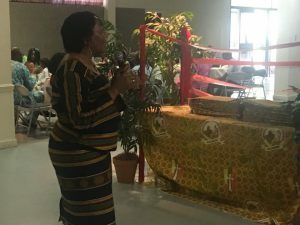 Very generous donations from, among others, Dr. George Awah, Yaa Fidelia Ngonda, the chair emeritus maitre Jude Ambe, the co-chairs of the Steering Committee, the Devoted Ladies, Mr. James Nkuo, Jenee Stella, etc. had brought everyone close to the target, but not over the top. 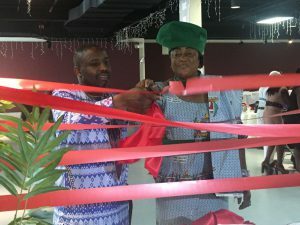 Held up by other commitments and unable to join members earlier, Mr. Atang arrived in time to close the launch in style. Parishioners present could sense it coming. They rushed to welcome him in dance into the hall when they got word he was making his way in from the parking lot. 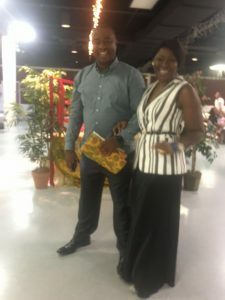 Mr. Atang stepped up to the sales point in the hall and whispered something into the ear of one of the ladies leading sales. A brief second after, ululating broke out. Then, the ladies broke into dance. The DJ was a little confused if he should roll, not having heard anything. The MC had stepped out of the hall and was MIA. 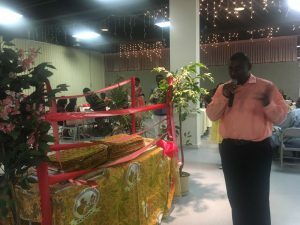 Bobe Lambert Mbom had taken over the microphone, but he, too, was still trying to find out what Mr. Atang had pledged or paid up. 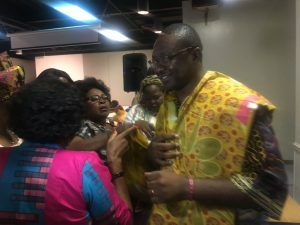 Then, Mr. Mbom did the drum roll and let it be known: on this launch day, and despite the small crowd of members in attendance, the target had been met and surpassed. 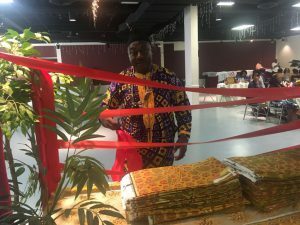 “We have sold out,” he announced, “thanks to two thousand ($2,000) dollars contributed by Mr. Atang”. It was a suspense-packed but truly blissful moment. Members gathered anew in the middle of the hall and Bobe Mbom offered a word of prayer and thanks to our Father in Heaven. 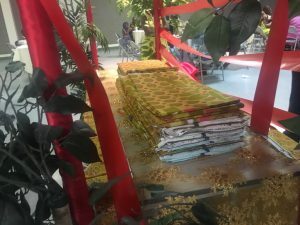 According to the most updated figures, a grand total of $7,000 was the revenue from the sale of the first 103 pieces of the fabric. 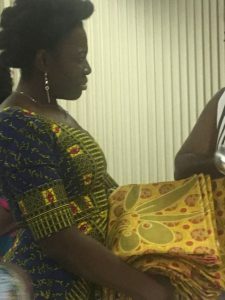 Obviously, only a part of the total revenue can be considered profit, given the costs incurred, among others, for the design, printing, and shipping of the fabric from Cameroon to the United States. 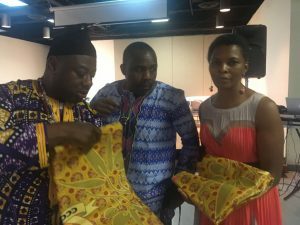 Huge chunks of the fabric are still left in Cameroon where they are available at two sales points: in Bamenda and Douala. All payment must be made in the USA, in dollars, at the minimum price of fifty ($50) dollars per fabric. 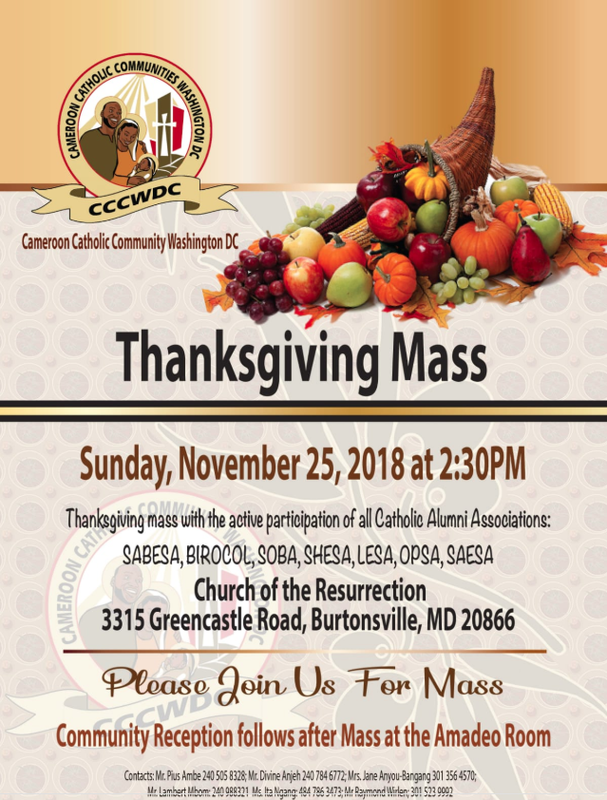 For obvious strategic reasons, the “ashuabi” launch date had been picked to coincide with the CCCWDC regular end of month Mass. Celebration of the Eucharistic had been led earlier by Rev. Fr. John Ambe (Rector of Saint Thomas Aquinas Major Seminary, Bambui. 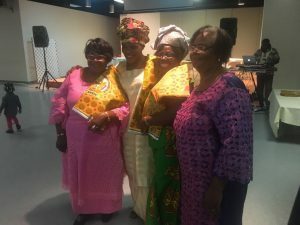 The co-celebrants were Rev. Fr. Emmanuel, Rev. Fr. Derrick (first Catholic priest from “Small London”), and Rev. Fr. Maurice. All three younger priests (compared to Rev. Fr. Ambe) had been seen through their priestly formation by Rev. Fr. Ambe. “This is our father,” Rev. Fr. 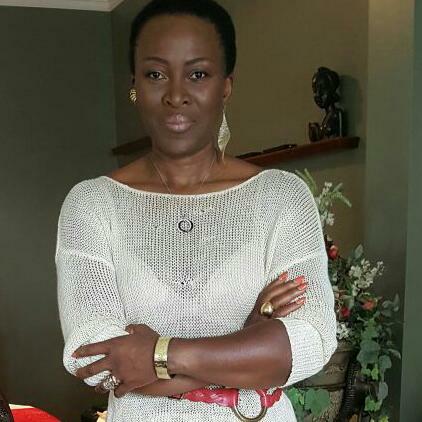 Maurice Akwa had bumped an usually shy Rev. Fr. Fale off the microphone earlier in church in order to invite parishioners to help all priests thank Rev. Fr. Ambe for their formation. 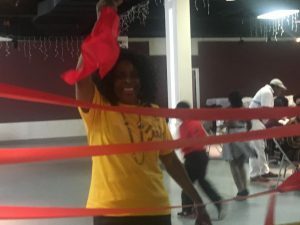 The call yielded a basket of offering worth over one thousand dollars to help Rev. Fr. Ambe “buy bananas” on the way back to Cameroon. With the exception of Rev. Fr. 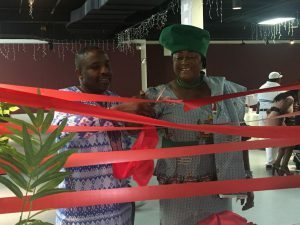 Derrick, the priests joined parishioners for the uniform ribbon cutting and unveiling event in the parish hall after Mass with Rev. Fr. Emmanuel Fale saying opening prayers. 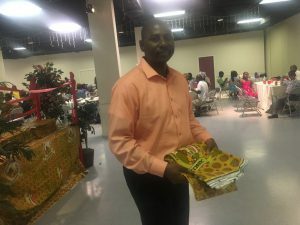 Since its inception ten years ago, this is the first of its kind for the Cameroon Catholics in the U.S. to create a festive fabric. 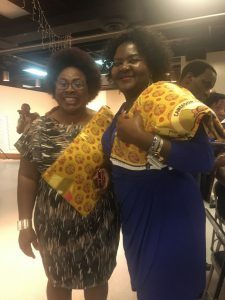 Among other culturally relevant artifacts, the fabric promotes CCCWDC’s very unique diverse approach to evangelization, a theme widely promoted by the Universal Catholic Church to create rich and diverse communities of the faithful around the world. The commemorative fabric communicates a tradition embedded in our rich African-American traditions to always put on our ‘best’ for Sunday Mass. Building on a theme, color, and symbols, this commemorative print will endure beyond the planned October 29th tenth anniversary celebrations. The new fabric design consists of the Holy Family in a circle adorned in a splash of sun rays. Placed just above the Child Jesus, is “The Way of The Cross” in bright shining white color against three columns in yellow, black, and red. The community name is inscribed in the outer circle. Scattered throughout are olive branches, both large and small. The dominant color palate is a pleasant olive. The shining “Way of the Cross” is hard to miss on the commemorative fabric. It sits above The Child Jesus, and baths in the rays of the sun. It is a reminder of Christ’s suffering and death for our redemption. We must live as victors for the shinning Cross reminds us of Jesus’ victory over death. As individual members of our community of faithful, the fabric should remind each of us of our own cross, and of the need for us to pick it up daily and bear it as Jesus did our sins on The Way to Calvary. The abundance of olive branches in the print signifies peace offerings. This is a community that bears all, forgives all, asks and honors all offering of peace symbolic if its challenges and successes. St Joseph, Our Mother, Queen of the Most High, and Child Jesus honors the Holy Family—father and mother smiling are both patron saints of families symbolize not only by the halo around their heads, but by the bright rays from the sun shining down on them. This final piece; the Holy Family enclosed by the name of the community and placed on a decorative ribbon carrying the acronym has been adopted as the signature feature for the CCCWDC logo. 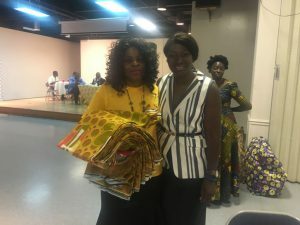 Proceeds from the launch on 28 August 2016 and all other ongoing and future sales of the fabric will go to support the tenth anniversary project “Let There Be Light!” The goal of the project is to provide solar electricity to missions in rural districts of Cameroon, most especially to vulnerable families in remote villages.